Articles attributed to this author are designated in EB1911 by the initials "T. H. H."
On the Educational Value of the Natural History Sciences. [An address delivered at St. Martin's Hall] (London 1854). "Professor Huxley" in Cartoon portraits and biographical sketches of men of the day, by anonymous, illustrated by Frederick Waddy, London: Tinsley Brothers, 1873. 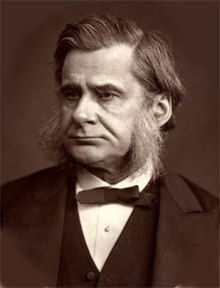 "Huxley, Thomas Henry," in Dictionary of National Biography Supplement, London: Smith, Elder, & Co., (1901) in 3 vols. This page was last edited on 24 January 2018, at 10:27.